Peter Bakwin has the FKT, 18h43m22s, Dec. 2-3, 2006. Jennilyn Eaton has the women's FKT, 21h52m33s, Nov. 9, 2013 (crewed & paced). The White Rim Road is a beautiful, 100-mile jeep road (with 7 miles of pavement) in the Islands in the Sky district of Canyonlands National Park, near Moab, Utah. The "White Rim in a Day" (WRAID) has been a classic for mtn bikers since it was first done (probably) by Buzz Burrell in the mid-1980s. Paul Pomeroy and Emily Loman ran the White Rim Road in a single push of around 28 hours in Fall of 2002. Emily had an injury flare up during the run, so their time was slow. Paul went back again on April 12-13, 2003, and did the loop in 21h57m. 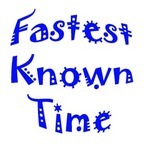 Peter Bakwin lowered the time to 18h43m22s on December 2-3, 2006 (report). Charles Corfield started the run with Bakwin, but was stopped at 50 miles due to a foot injury. Charles has completed the loop on 4 occasions since then, in December 2007 (don't know the time), March 2008 (19h51m), December 2008 (19-20h), and December 2013 (don't know his time). On two of his trips Charles carried a GPS and measured the total distance at 99.79 and 99.81 miles, respectively. Justin Snow measured the route at 99.95 miles by a GPS carried on his mountain bike in April 2009. Kelly Agnew set the current FKT of 17h47m25s on March 8, 2014. His trip report is here. He followed Pomeroy's approach of running counter-clockwise, starting at the bottom of the Shafer Trail. We are removing Agnew's FKT due to his being caught cheating at Across the Years. Jennilyn Eaton set the women's FKT of 21h52m33s, Nov. 9, 2013. Her report is here. Eaton was paced the entire distance by Craig Lloyd, who posted a report here. She started at Mineral Bottom and ran clockwise. "I ... start at the bottom of the Shafer Trail, to get the biggest climb out of the way early. At the top of Shafer, head north on the park entrance road until the turn off to Dead Horse Point, go straight ahead and watch the mile markers on the east side of the road. A little after the 10 mile post, is a left turn which is the dirt road to Mineral Bottom. Nowadays it is well maintained by the gas-well contractors. At runner's mile 26 you will descend to the Green River turn left at the junction near the bottom. This puts you on the White Rim trail which will take you all the way round and back to the bottom of the Shafter Trail. This route is bang on the nail 100 miles around (plus/minus GPS error). The running is straight forward, but there are a few points to bear in mind for a crew vehicle. In winter the Park Service closes the gates at the top and bottom of the Shafter Trail. When they are open you can drive up and down Shafer. When they are closed you will need to come in on the Potash Road (rugged 4WD vehicle advised), drop off the runners, drive back out the Potash Road, come in on the park entrance road (Rte 313) and intercept the runners at one of the junctions: Mineral Bottom road, or Dead Horse Point road. Once you are on the Mineral Bottom road the runners and vehicle follow the same route whatever time of year. There are a few places which can be difficult for vehicles when there is ice or when it has rained and the bentonite clay turns slick: a narrow ledge over the Green just after mile 30; the steep ramps at Hardscrabble; and the steep ramps at Murphy Hogback. If there is snow/ice, bring chains for all four wheels. Allow extra time in your estimates for winter conditions, since you will have more things to take care of on the way around." I remember reading about a guy (a LONG time ago) who ran WRIAD completely unsupported and used a bike trailer to haul all of his water (if I remember correctly the guy worked for REI or Patagonia). Does anyone have any more info on this or any info on any other unsupported runs on the White Rim? 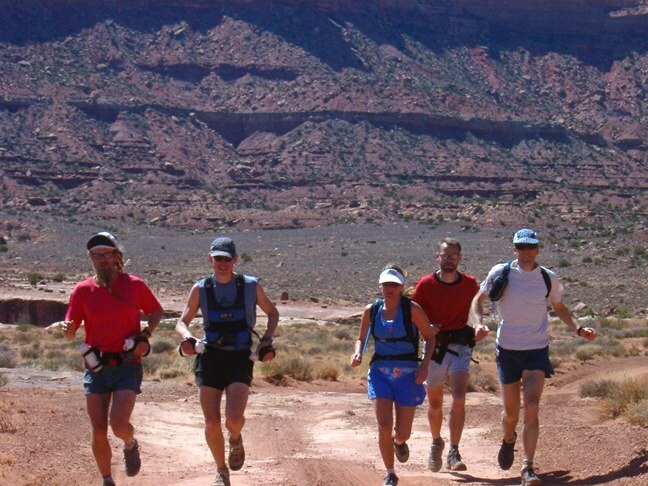 A new women's FKT was set on the White Rim on 11/9/2013 by Jennilyn Eaton of Salt Lake City, UT. She ran it in a time of 21:52:33. She ran clockwise starting from Mineral Basin. She was crewed by her husband and friend, Matt. I ran the whole distance with her. A report and details will be provided by her soon. I want to thank Peter for inspiring me to make this attempt. It took ideal conditions for me to pull it off and it bolstered my respect for the man that has held the FKT for so long. Thanks, Peter. Nice! Excellent time. I'll update the main post above when I get home in a couple of weeks. Congrats! Kelly certainly deserves a chance to respond to the allegations but considering he has been unresponsive to requests and deleting all related social media and blog posts it sure doesn't look good. He has pulled down his reports from both of his 'records'. There is no proof - for or against in setting these records. But once a cheat, always a cheat.